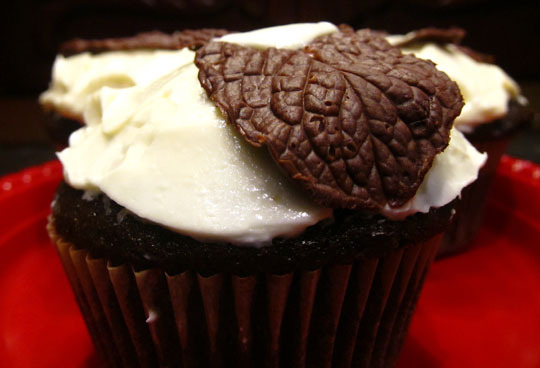 I wanted to make something special for a holiday party, so I decided to tackle Martha Stewart’s Chocolate Mint Cupcakes, complete with mint chocolate leaves. 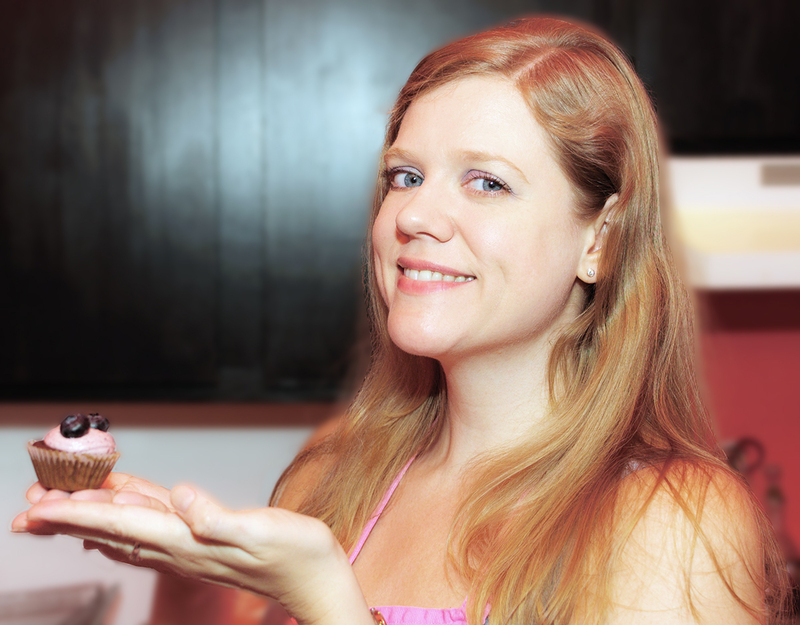 The recipe can be found online and in her cupcake cookbook. I’m not ashamed to say that I am a Martha Stewart devotee. Some of her instructions in recipes and craft projects may be a little obsessive-compulsive, but she knows what she’s talking about. These cupcakes were more time intensive than others I’ve made lately, but they were worth it. First, the leaves… It sounds a little crazy, but Martha’s recipe has you paint chocolate onto the back of mint leaves with a brush (one version says to use a paintbrush, the other indicates a pastry brush), refrigerate them, then peel off the mint leaf. What’s even crazier is that it worked! The chocolate leaves really came out looking like mint leaves. It was tedious to peel off the mint (I used sanitized tweezers), some broke, others melted with a touch of my hot fingers. 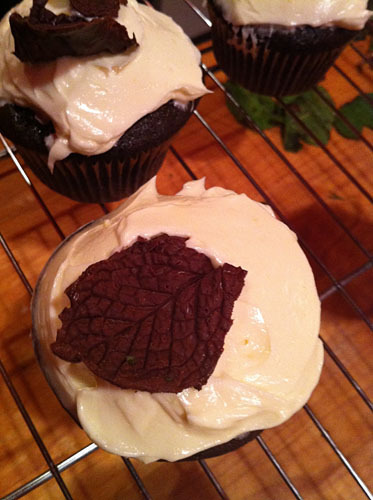 However, I ended up with enough good-looking leaves to add one or two to each cupcake. 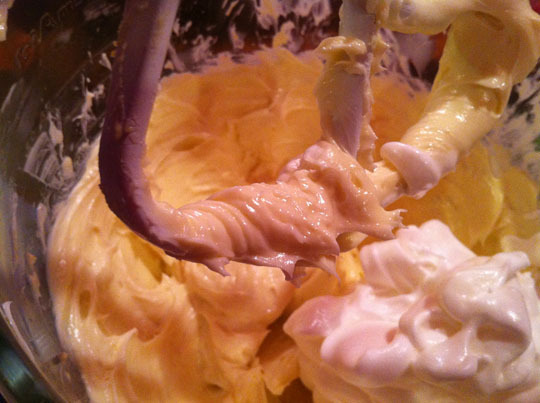 The cupcakes themselves were easy enough, though I felt the batter was especially thin. Noticing this as I mixed it, I added an extra 1/4 cup of flour. I know, going against Martha’s directions, but it felt like the right thing to do. It was my first time doing this type of buttercream (a meringue buttercream of the French variety, involving yolks in addition to the egg whites), and I don’t think I realized what I was getting into. I was very glad to have 2 mixing bowls. I used my metal bowl for the steps requiring cooking in a double boiler (yolks/milk/mint and whites/sugar), washing it quickly in between, and the glass for the butter and final whipping. The frosting came out rich, but it was also light at the same time. It is very buttery, and might not be a match for all types of cake, but it works well on these particular cupcakes, in my opinion. I iced the cupcakes a few at a time, peeling off mint from a chocolate leaf or two (fresh from the refrigerator or, after staying out a bit too long, the freezer) to add to each. I was pleased with the way they turned out. Some who tasted them claimed they were amazing. They were on the rich side for me. I liked them, but one was plenty!